Fiquei muito satisfeito com a minha estadia em Via Amesterdam, é um lugar muito agradável de ficar, com uma boa staff, com muito fácil acesso para a cidade via metro. 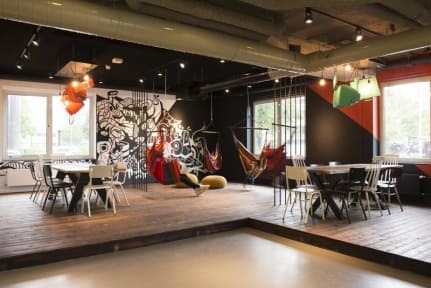 Recomendo este hostel a todos e fico muito agradecido a staff pelo ótimo ambiente que por lá mantém. Great place! Calm and happy. 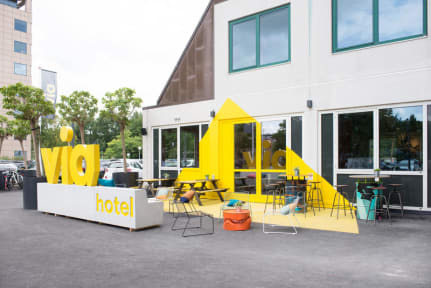 Nice of activities at the social areal, cinema, friendly staff, good breakfast but expensive for a hostel. Close to train station to airport and metro to city center, each way takes around 20 minutes, be aware of the costs. I spent around 20 euros for 4-day ticket that i could use in metro, tram and bus. Really great. To go to airport you should buy a train tickey around 5 euros one way from the train station near the hostel. Towels cost 5euros. This hostel is amazing! Very well decorated, nice staffs, nice places to chill! A great atmosfere! The only problem is that is far from the city, but there is a metro and train station very close to the hostel. At night is possible to take a night bus, but I think even not been too close, it was worth it because the acomodations and the common spaces were awesome! I would toltally stay here again!